Very touching end of podcast song homage. Episode 74 - Pick Barb Wire!! I think Ron made the wrong call on this one. I recently put my Big Game on location where our league plays and it’s killing it. It’s the dollar-game of choice now for our pinheads. However, mine is setup steep and fast, spinners are rocking, and the flipper guides are removed so you can drain between the flippers. Game is anything but a ponderous widebody! NYC’s Greg Poverelli joins us this week to talk some pinball. Ryan C joins us this week as we go off the rails. Honored to be ripped off by the new gold standard. A couple call out corrections on Episode 78. On Whitewater, “Get the extra ball ya weiner” appears once out of every 5 games when you light extra ball off the whirlpool award. On Indy 500, “Get the extra ball ya wanker” appears maybe once every 50 games or so. At one time when I worked at an arcade, I only heard the I500 wanker call out once. I own an I500 now and only heard it once when I first got the machine. Obviously I don’t hear it anymore cause I turned off extra balls. I agree Cheetah is a great widebody. Thanks Jason!! Aways liked Indy 500, don’t think Bruce is a fan. No TWIPY, no problem. 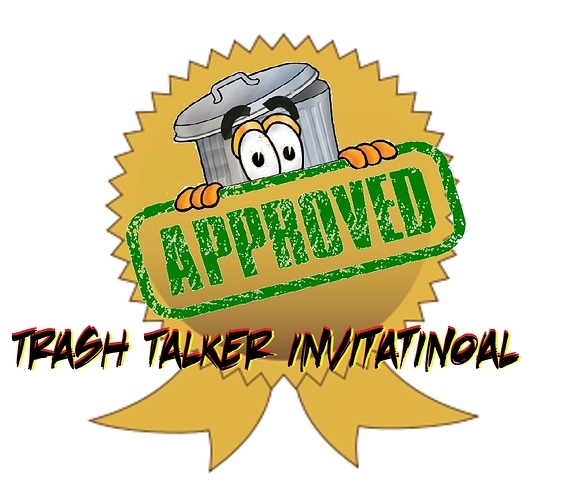 The Slam Tilt Podcast is the first to be awarded the Trash Talker Invitational Seal of Approval. This is, by far, the greatest honor we have ever received. Thank you!! Martin Robbins from the Head2Head Pinball Podcast joins us as we time travel to the future. Stern designer & former World Champion Keith Elwin joins us this week. Inconceivable. Must have been a voice actor.